Located at Kalimati, Kathmandu, Kathmandu Engineering College, commonly known as KEC, is one of the leading colleges for engineering in the country. The college came to existence since 1998 with the mission of generating highly efficient professionals in the field of Engineering and Architecture. The college is also the first of its kind to be ISO 9001:2000 certified college in Nepal. The college believes in imparting superior and quality technical education by the motivated and experienced academic professionals to the students. Kathmandu Engineering College offers various undergraduate courses in engineering and architecture. It offers Bachelors in Architecture, Bachelors in Civil Engineering, Bachelors in Computer Engineering, Bachelors in Electrical Engineering and Bachelors in Electronics and Communication with an emphasis on understanding the subject with broader perspectives. Besides these, it also offers education in science and humanities as well as Mechanical engineering. The college promotes a friendly competitive learning environment to help the students graduate as professional who meet the national aspirations and are able to overcome any challenges in life. One of the private engineering colleges in Kathmandu, Kathmandu Engineering College is affiliated to the Tribhuvan University (TU). 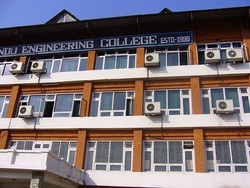 The students who qualify through the entrance examination conducted by the Institute of Engineering (IOE) every year are capable of applying for admission in the college which means that to study engineering in Kathmandu Engineering College, a student must pass (or say qualify) in the entrance examinations taken by Institute of Engineering (IOE). The intake capacity of the college is limited and it does not enroll students exceeding its class capacity. The maximum enrollment of the students for civil engineering is 121, while the enrollment for electronics and communication engineering is 132. Similarly, the intake for computer engineering is 88, for electrical, it is 44 and the student intake for architecture class is 55. Kathmandu Engineering College located at Kalimati is one of the reputed private educational institutions for engineering studies.